OK, so Sal’s inquiry resembled an angry statement more than it did a question, but he did raise a good point: Why DO we sell radiation detectors on a site that focuses mainly on water quality and water quality testing? Hydraulic fracturing activity in Pennsylvania has generated waste that contains radioactive material. Data collected from water samples taken at and around the certain facilities in New York State that accepted Pennsylvania’s fracking leachate… has come under fire since a Syracuse laboratory very recently plead guilty to one felony count of mail fraud that quite possibly involved 3,300 falsified water tests and that laboratory performed a number of the tests at the facilities. Radioactive materials occur naturally in shale formations with concentrations varying from well to well and from formation to formation. Some experts believe the Marcellus Shale Formation could possibly contain the highest concentration of all the United States’ shale formations. Fracking waste includes brine, chunks of rock and ‘drilling mud’ which all could contain higher than desirable levels of radium isotopes in cluding one called Radium 226 which proves particularly worrisome since it dissolves in water — and could therefore travel quite far from the well site and/or dumping area during a good rainstorm. In this case Pennsylvania started looking into the matter of radioactivity and fracking waste in the beginning of 2013. New York State has started no such inquiry. Coincidentally, a certain company that manages fracking waste in Pennsylvania recently asked a landfill across the border to begin accepting fracking waste 49 percent faster than it had in the past. The article goes into additional details about the situation in a community 80 miles south of Rochester and we suggest you read the full article so you can get the whole story. Getting back to Sal’s question, though, tap water really ought not contain radioactive material. 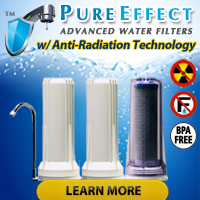 More than likely very few municipal water systems dispense drinking water that contains radioactive matter since things like that get monitored on a regular basis… BUT what about private water wells that NEVER get monitored for radioactive material? Remember that part in the article about Radium 226, a naturally occurring radioactive material that dissolves in water? What if a person lives in an area where this material exists naturally under the ground in rock formations? As ground water makes its way through rock formations containing Radium 226 and possibly to a well’s intake it likely picks up Radium 226 along the way… and carries it up to the surface where unsuspecting homeowners will use it for drinking, cooking, bathing, irrigation of foodstuffs, watering of livestock, etc. Oh, and as you read in the article referenced above, companies responsible for disposing of potentially radioactive materials taken from hydraulic fracturing sites apparently have an interest in getting rid of those materials any way they can BEFORE the government catches them red-handed — or better yet, until the government catches them with glowing red hands. The topic of hydraulic fracturing will not soon leave the headlines… in so long as stories like this keep happening. Shortly after a gas company began trying to extract natural gas from a shale formation in Michigan it experienced problems similar to those experienced by local residents with drinking water wells located near the hydraulic fracturing site. Water pressure dropped at the fracking site and negatively interfered with the drilling process. Coincidentally, water pressure dropped for local residents and they also started noticing a milky appearance to the water coming out of their wells. Related incidents or not related incidents? Some argue that the two sets of events have nothing to do with one another and that both sets of wells suffered as a result of serious drought conditions rather than because the hydraulic fracturing activity required a large (several million gallons) amount of water. Others argue that the hydraulic fracturing activity caused the aquifer level to drop by an estimated 11 feet, not the lack of rainfall. These same folks do not discredit the notion that drought conditions played a part, but they quickly reference other hydraulic fracturing sites where gas companies began drilling… and ran out of water. Did you say millions of gallons of water? Yes. It takes millions of gallons of water to perform hydraulic fracturing and typically that water will come from water wells drilled by the gas companies or from other local sources such as municipalities with pre-existing water wells supposedly large enough to bring up enough water to accommodate the drilling activity as well as their customer base. For the details that sparked our decision to write this little blurb about hydraulic fracturing and its relationship with drinking water and the water in aquifers tapped by private wells, please refer to Residential Water Well Fails in Michigan After Fracking Begins Nearby. The Pennsylvania Department of Environmental Protection (PADEP or DEP) declared that just under 80% of the nearly 1,000 complaints/allegations it handled regarding well water contamination had insubstantial evidence tying the contamination to drilling or possibly resulted from some other source of contaminants. PADEP reported that just under 20% of investigations resulted in some sort of water service disruption that required the water source to get replaced at the expense of a gas drilling company. PADEP appears to have issued letters confirming cases of water quality contamination and obligations to correct or replace damaged water sources… but does not actively keep track of how many such letters actually went out. PADEP may have ‘lumped together’ cases where multiple households became affected by the same water quality incident in an effort to make the numbers reported look more appealing. Private settlement agreements made between drilling companies and affected land owners do not show up in PADEP reporting. It came to light recently that even though laboratories conducted a rather inclusive battery of testing on water samples taken from private wells, the owners of those wells received documents containing only results for contaminants that PADEP considered relevant to the process of determining whether or not hydraulic fracturing had affected water quality. In some cases post-drilling sampling of suspected contamination zones took place at lower depths where statistics indicated a lower likelihood of finding evidence of contamination by hydraulic fracturing activity. Gas drillers have agreed to pay for new drinking water wells in certain instances but did not have to publicly acknowledge that their hydraulic fracturing activity resulted in the contamination of those wells. You have just read a few of the ‘highlights’ from an article that, in our opinion, gives a great deal of credibility to the notion that before any new fracking takes place, we need to get a few things in place: 1) Standardized and identical water testing procedures in place for pre-drilling and post-drilling sampling; 2) Better and more comprehensive system of record keeping for things like notifications of possible contamination; 3) Easier means of access for the public to any and all information pertaining to data collected during pre-drilling and post-drilling sampling so outside, third party analysts can put together their own pictures of what is really happening in regions where hydraulic fracturing takes place. The song lyrics ‘We Have Only Just Begun’ ring through the back our minds as we look forward to the potential environmental pitfalls that may lay in store for the areas where hydraulic fracturing occurred in the absence of adequate baseline readings and, from the looks of things, accidental (or intentional) inept follow-up sampling of water from private wells. … then turn to accredited third party water testing laboratories that have nothing to gain by telling anything other than the truth. As far as WHAT to test for, well, we suggest testing for as many potential contaminants as possible BEFORE allowing gas & oil companies access to your lands. 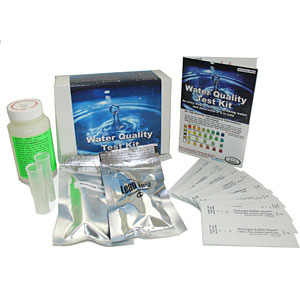 At this time the Water Test Kit Store carries mail-in water testing packages from National Testing Laboratories, an accredited water testing laboratory that provides test results from its certified water testing facilities within 10 to 14 business days of their receiving a sample. We do not KNOW the true consequences of our past actions, so can we please slow down and figure out how best to not make them worse? Previously when we wrote about fracking (hydraulic fracturing) we stressed the importance of performing water quality testing on well water and ground water in the region before any fracking activity begins. Today we happily report that officials in the Sanford, NC area required baseline water quality test results get recorded before any gas companies could get permits to begin drilling. Sanford, N.C. — Water-quality experts are testing people’s wells in Lee County to create a baseline that will help state regulators measure the environmental impact of natural gas drilling. Teams from the U.S. Geological Survey’s Water Science Center are fanning out across the county to assess the best places to test the groundwater. About 150 area homeowners have asked the USGS to test their wells, but officials said locations will be chosen based on scientific criteria. “We haven’t sampled in this area since the 1960s, 1970s,” Melinda Chapman, a USGS groundwater specialist, said Wednesday. State lawmakers are expected to consider legislation when they reconvene later this month that would allow gas drilling as quickly as 2014. As with any water quality situation, having baseline water quality test results to compare newer test results against makes it much easier to ‘prove’ that fracking mining or other activities in a region have had a negative effect on the water quality. While the exact reason for a change in water quality cannot always get pinpointed and/or assigned to a particular cause, not having before drilling test results to compare against makes it easier for gas and mining companies to deny that their activities in an area have anything to do with changes in the environment. Basic tests well owners can perform on their own? Do owners of private wells have to pay for (expensive) laboratory tests each and every time they want to check their well water for evidence of contamination by fracking? Only sophisticated laboratory testing can detect some of the chemicals contained in fracking fluid but simple tests for indicators of contamination do exist. 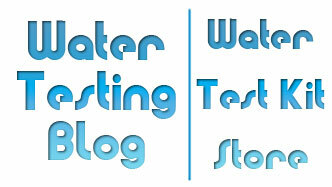 Total Dissolved Solids (TDS) – This basic test checks for the presence of dissolved solids in a water sample. Spikes in TDS readings may occur on a regular basis but prolonged spikes with no apparent cause (i.e. heavy rains, etc.) may serve as an indicator that a new contaminant has entered the water source. Simple meters like the COM-100 EC/TDS Meter and AquaPro TDS Water Tester make monitoring the total dissolved solids levels in samples a quick and easy process. Heavy Metals – Since drilling involves a large amount of metal in its operations monitoring the level of heavy metals in ground/well water near hydraulic fracturing activity makes a lot of sense. Products like the SenSafe Heavy Metals Test Strip allow users to quickly and easily monitor a water source’s overall heavy metal content — without the need for complicated lab equipment, potentially hazardous reagents, etc. pH & Alkalinity – Keeping an eye on a water source’s pH and alkalinity also aids in determining if hydraulic fracturing activity in a region has had an effect on water quality. Sharp, prolonged changes in pH and alkalinity may indicate the possible presence of unwanted chemicals in the water source. 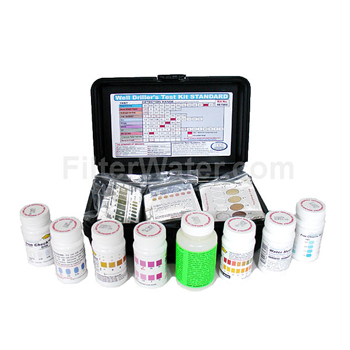 Meters like the pH-200 Waterproof pH Meter make pH testing about as easy as it gets. For those unwilling to spend the money on a meter, you can also use more traditional methods like pH & Alkalinity Test Strips. Establishing the quality level of well and ground water in Sanford, NC prior to any fracking activity begins may give homeowners a leg to stand on if the quality of their water suffers after hydraulic fracturing begins. It may also provide the gas companies with the evidence they need to ‘prove’ that hydraulic fracturing did not affect the quality of water in the area. A double-edged blade, yes, but in our opinion a necessary one for any region considering issuing hydraulic fracturing permits to gas companies. 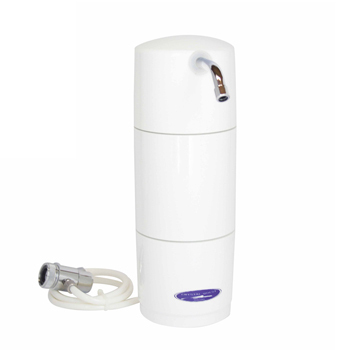 Why Might I Need a Water Filter? We get asked this question more times than we care to count… and we don’t mind answering it because at least it means the people asking us have taken an interest in the quality of the water they drink, cook with and use for showering/bathing. Contamination of natural bodies of water (including lakes, streams, aquifers and groundwater) can have numerous characteristics and sources. While many believe only ‘big business’ causes water pollution, all humans and animals release waste products that eventually find their way into lakes, rivers, streams, oceans, etc. Scientists refer to this occurrence as ‘nutrient loading’ and when it happens too often in one location nutrient loading may result in bacterial contamination that eventually becomes detrimental to the environment and harmful to humans who unknowingly consume the water. Contaminants often included in the list of ‘natural’ contaminants include things such as coliform bacteria, nitrates, nitrites, etc. Therefore, if your drinking water comes from the ground (i.e. a well) you may have ‘natural’ things to worry about… and even municipal (i.e city, town, etc.) water sources have problems from time to time. Need proof? Ever hear of things called boil water advisories? This type of contamination typically comes from accidental or intentional dumping of foreign matter into or too close to a body of water either on the the surface or under the ground. Common sources of groundwater and surface water contamination include improper disposal of industrial waste products, faulty septic tanks and waste water storage or processing equipment, landfills, pesticides and fertilizers. Many experts believe the practice of hydraulic fracturing certainly belongs in the category of unnatural water contamination and pollution… and, of course, many other experts (who often work for or get funding from gas drilling companies) believe hydraulic fracturing poses no (or extremely limited) risks to the environment. Thus far OUR opinion falls more in line with the folks who suspect that fracking (the nickname for hydraulic fracturing) may pose risks and that more research needs to get done before we turn the Marcellus Shale Formation under the United States into swiss cheese whose holes we filled with ‘questionable’ fluids containing a host of unknown compounds.